Chelsea Flower Show - what can I say? Other than it was great to be back. True to form, we had all the weather that you can imagine, freezing cold, intense heat, hail, rain - all part of the fun of an outdoor show, especially when I had probably the smallest 'hut' at the show in which to take shelter. We were very pleased however to earn a stand award and it was nice to see old clients again, and meet new customers. 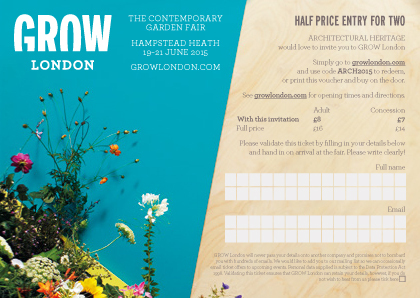 We will be back next year..
New garden show - GROW London (19th - 21st June) - continuing on the shows theme, we are off again at the end of the month to pitch our stall at GROW's second contemporary garden fair, in a big tent on Hampstead Heath. This is definitely not Chelsea but I think the show has a fresh take on all things garden and I am very much looking forward to being part of it. Should you wish to pop along, please see below entry form received by the show organisers to be completed (they want your details!) for half price entry. Sorry I can't get everybody free entry. Click on the form to go through to the GROW website for further information. Latest stock to follow soon and, as ever, please do not hesitate to contact me if you have any requirements that I can help with at this time.